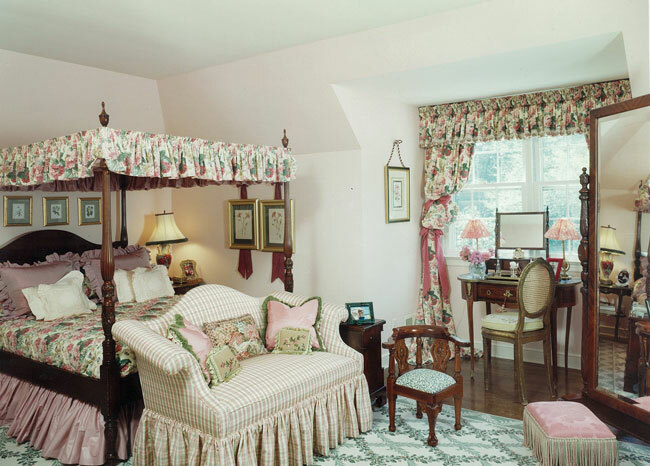 These Connecticut clients wanted a very Old World English Country Bedroom for their Country Retreat Farmhouse in central Connecticut. Having to stay in the flavor of this charming Clapboard / Stone Country Estate with stone fireplaces in almost every room, I was certain from the moment I saw a photo of the exterior of the home the design direction that I would take.The project entailed designing /decorating the 2 guest bedrooms in the upstairs "addition ". As I always do, I gave the clients 2 design presentation options, but it wasn't until I came up with what you see here that they made a decision. It was the polished English Country Chintz...they just loved the lilacs in the pattern...and were delighted to use that beautiful mauve / lilac color palett. The English Mahogany 4 Poster Bed is an Antique circa1875 American, that I found in NYC at auction. It had a fine hand-rubbed finish and it is exquisitely carved. Being grandparents, they fell in love with my idea of using a child's chair ! In the right corner is an 18th Century Cheval Mirror with finely carved ball 'n claw feet.